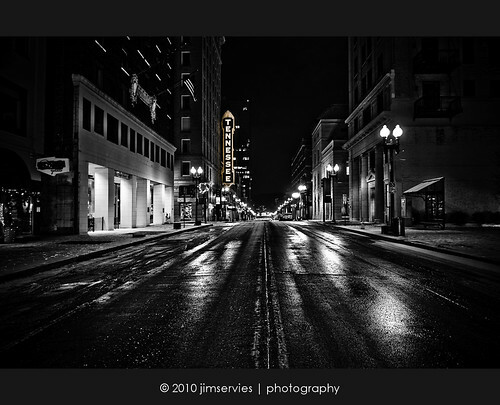 Tennessee Theater | Knoxville, TN, originally uploaded by jimservies | photography. I originally posted this on my flickr account , jimservies | photography and thought it would make a good blog entry for today. Hope you enjoy it as much as I did shooting it. There are so many great photos of Gay Street and the Tennessee Theater that I found it difficult to put my perspective and “DNA” on something new. Many admired photographers have produced inspiring photos of Gay Street and the Tennessee Theater that I’m hesitant to even post this. And honestly, I’m just not sure how I feel about it at this moment? This high-contrast B/W version (color version available) is the one I like the best – at least for today. I hope you enjoy it too. Please see links below for more information. Please take a moment to contact us if you have a question or just need help finding something. We are more than happy to help.